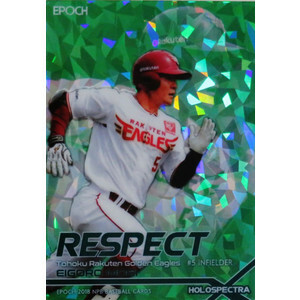 Last year, Epoch tried their hand at a big current set with a Pacific League set. Granted, that was much smaller than this set, but it was a start. Now, Epoch has a full set covering all twelve teams for the first time since 2000, I believe. In 2000, Epoch issued a pack-based sticker set similar to Panini's stickers of the 1980s and Topps' stickers of the past decade or so. 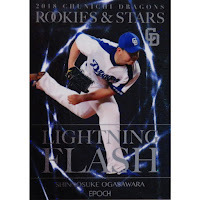 And I believe this is Epoch first comprehensive NPB set in nearly 20 years. Base cards are pretty attractive. It's not too busy, but the design is fairly unique. Backs are similar to what BBM does - biographical stats, another photo, some stats, and a career biography. There are 432 cards in the base set, 36 cards per team. If McGehee's photo looks a little grainy, that's because it has a shiny holographic background which doesn't scan as clean as a regular card. 72 players have the holographic parallel (six per team). Odds for parallel cards is 1:2 packs. The common insert card is called Silver Foil, which you can see on the front and back. The set is divided into subsets. Silver Foil cards come about 1:2.5 packs, and there are 60 cards in a set - five per team. And here is Rookies. I don't recall seeing a Hurlers subset, oddly. 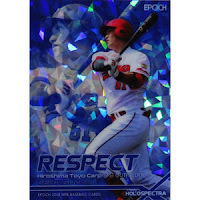 Hologram Foil is a 1:12 insert set with 24 cards - two per team. Finally, Holospectra fall 1:144 packs, with 36 cards in the set, making it the most challenging set to finish in this release. Each card comes in Green, Blue and Red versions, though Epoch didn't release any print runs or odds for the different colors. However, the above green card is #/15, and the blue card is #/7. The red parallel might be a 1/1. I'm still looking for my base set, but I definitely want a complete set. Hopefully one shows up at a good price soon! 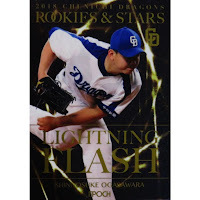 The Dragons Rookies & Stars set was released on May 19th, with five cards per 400 yen pack, and the usual 20 packs per box and 12 boxes per case. The base set clocks in at 90 cards, but they're numbered 1-70. Twenty players have photo variations, though they aren't short-printed and are being considered part of a full set. I think Epoch was going with a sort of art theme - maybe a framed painting with bronze plaques above and below the image? Anyway, regular cards use white card numbers on the back. This is an image variation, and you can see the light blue card number on the back. And for you bat flip fans, Merry Christmas. There are two limited insert sets to be found in packs if you're lucky. Lightning Flash comes in Silver #/75, and Gold #/50. Super-rare Force of the Dragon is found in base #/10 and parallel #/5 versions. A total of 32 players have autographs in the set. Twenty-seven of those have regular horizontal autographed cards with silver backgrounds. Eight players have gold vertical parallel versions. Rookie Signature horizontal cards can be found for six players, with three players having vertical parallels. Print runs vary wildly - one player has only three regular autographs, while others have up to 74. When will I come across these cards again? Hopefully soon! "Kira" is the Japanese word for shiny. So, here's the shiny! These are all cards from the May collector's card show, which a small show with maybe six dealers. I came away with a few great finds at great prices - that Jeter card I showed last week was probably the best, but some of these were acquired at great prices. Perhaps this Elite of Nine insert tops that list. 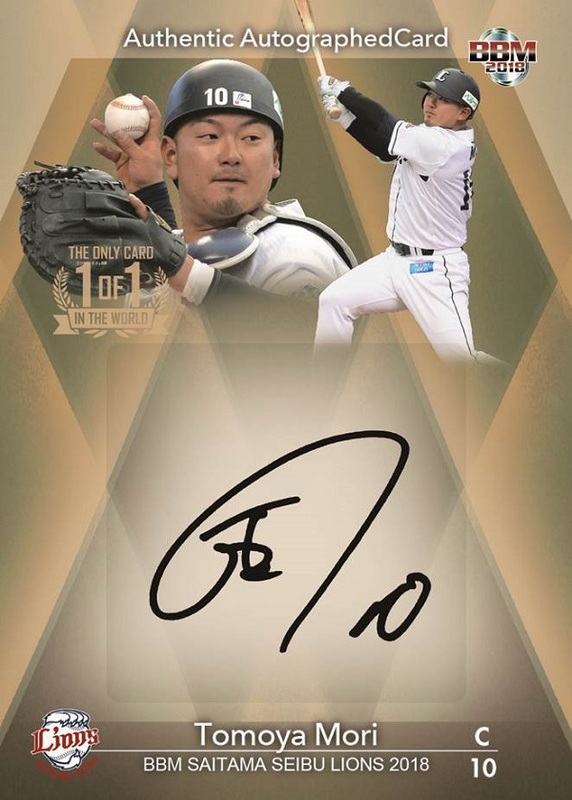 This insert series is serial numbered to only 50 copies each and usually carries an unnecessarily high premium. We're talking late-90s prices - $20 for commons isn't that uncommon. They're clear acetate cards - my scanner has a black background so that gives my scan a darker image. These two inserts are fairly run-of-the-mill but not that easily found. I didn't need the Uehara but the price was right. This Running Specialists insert from 2005 carries a decent premium over other inserts, but again, good deal means gotta grab. Every time I see a 2001 or 2002 BBM insert I end up buying it. Maybe I'll try building a master set. Foil signature cards are common "premium" cards found in BBM's box sets. Most collectors have realized that these really aren't that special and prices have dropped, but there are still plenty of sets I need samples for. BBM issued a box set commemorating the Carp's 2016 season and included a large 3D box topper in each box. I now have two of them - this one only cost me 100 yen, I think! And that'll do it for tonight! The next card show is this Sunday, actually, though it's the big Trading Card Festa, with card shops instead of collector-dealers. As such, it can be hit-or-miss; sometimes there'll be a really fun box to open up (I got two boxes of Topps Stickers at a super-low price a few years ago) or there will be a fun dime box, but other times it's just regular sellers with essentially regular prices. I do have a few things I'll be searching for specifically. 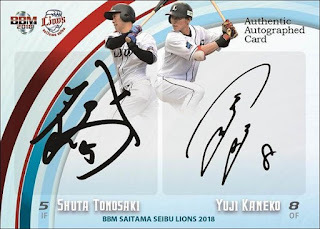 A couple new sets are hitting shelves this week: the Buffaloes and Hawks team sets from BBM, Tigers team set from Epoch, Calbee Series 2. And maybe I'll be lucky with my Calbee and other set building? With all the NPB cards I put on this blog, you'd think that I've forgotten about American baseball. Did you know that there was an Aunt Jemima Pancake House in Disneyland? Anyway, while I don't show off many of my US card purchases, I do pick up what I can. There was a card show last month, and now that I'm finally ready to start showing my treasures, let's start with some of the fun MLB cards I picked up. I've posted plenty about CardGen, but I'm still happy to grab singles when I find them. I really enjoyed Panini Golden Age. It was a good response to Allen & Ginter and Goodwin Champions, with an interesting mix of celebrities and sports stars from the past. The base set design was interesting though not exactly outstanding, though Panini also included a nice variety of inserts. Some of those inserts were based on old sets (Fan Craze and Nu Card Scoops, for example). I didn't actually need these cards for any sets. I already have them all. But I didn't realize that when I got them, so they're just fun extras to look at for now. Eventually, I'll find them a nice home. Another day, another team set. 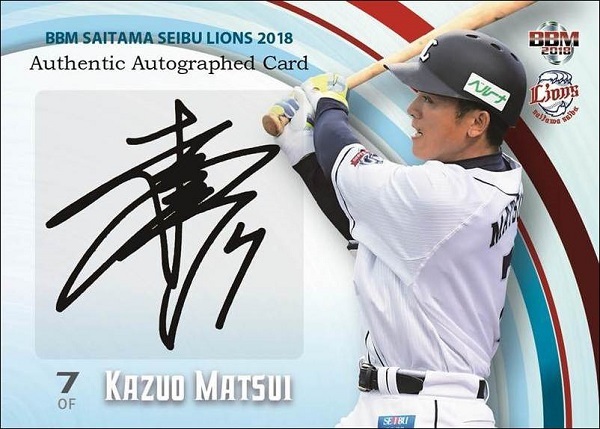 The Lions version came out at the end of May, with the usual 81-card base set, inserts, and hits. 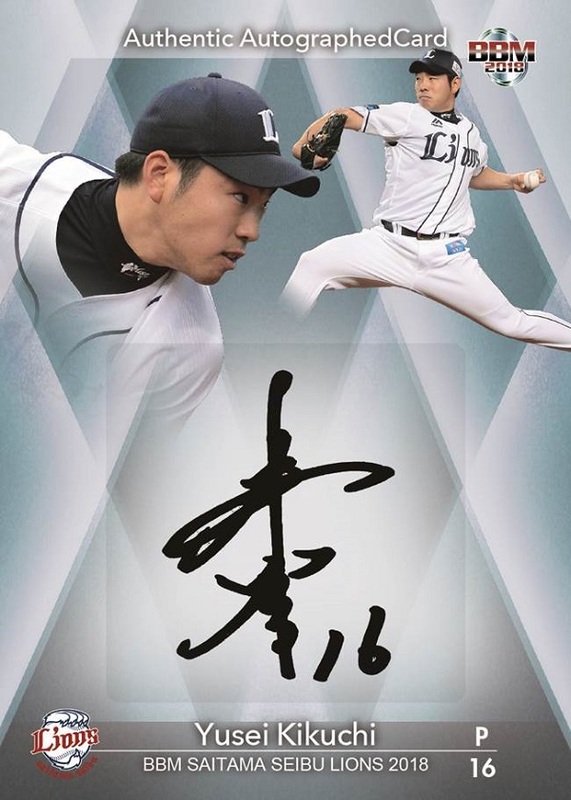 The regular base cards use a hand-written font, a trend for BBM for the year. Cards L01-L68 feature regular players plus a dual-mascot card at the end. There is no checklist card. The subset cards have no obvious meaning. Catch The Moment is six cards, possibly for clutch hitters. Kazuo Matsui's statistics from his days with the Lions are on the back - the 2004-2017 seasons were spent in the US and then with the Golden Eagles. 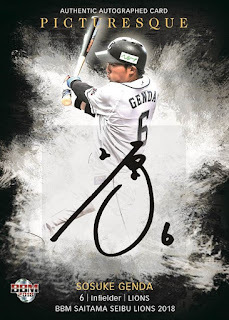 He's had a pretty solid NPB career, actually, with a career average of .344. The last line of his statistics is his 2018 line, with only 9 appearances and 15 at-bats boasting a .333 average. 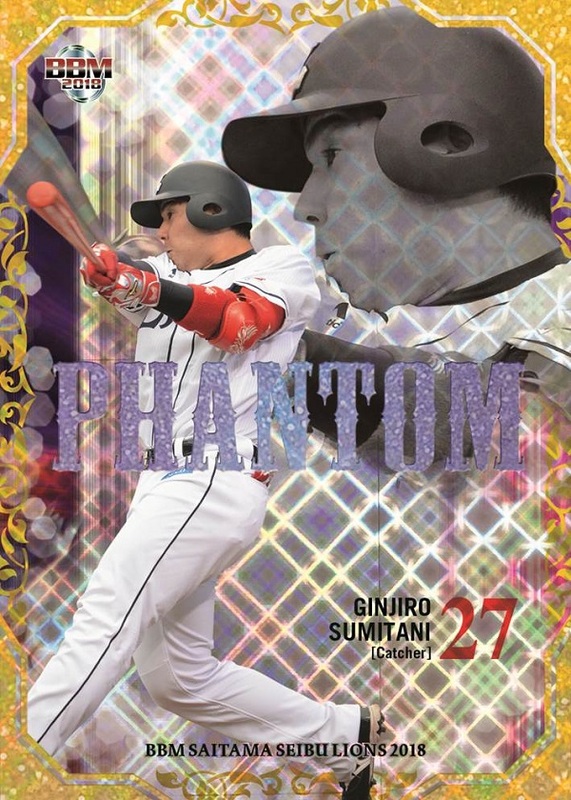 However, since this card was printed, he's appeared in 2 more games, gained four more at bats, and lost a hit. 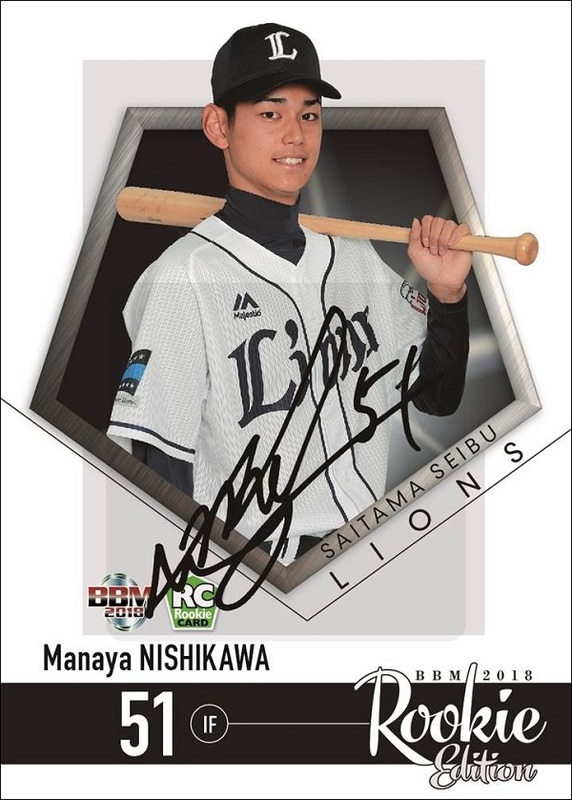 His NPB page says he has only four hits this season. Poor guy. The fastest players must be in the three-card Accelerator subset. The final four cards are in the Reign Men subset, featuring award winners. The regular inserts come in the usual three tiers of parallels: Gold #/90, Holofoil #/75, and Gold Holofoil #/50. There are 18 inserts total, split among four sets. Rocket Arms: 3 cards, pitchers. Phantom is #/25, and features 12 cards for the Lions. Every player has a regular autograph card, #/60 or less. There are two Combo Authentic Autographed Cards, #/5 each. Silver Autographs are #/9, and Gold Autograph parallels are 1/1s. There are nine cards in each set. Six players have Rookie Autographs, #/10 each. 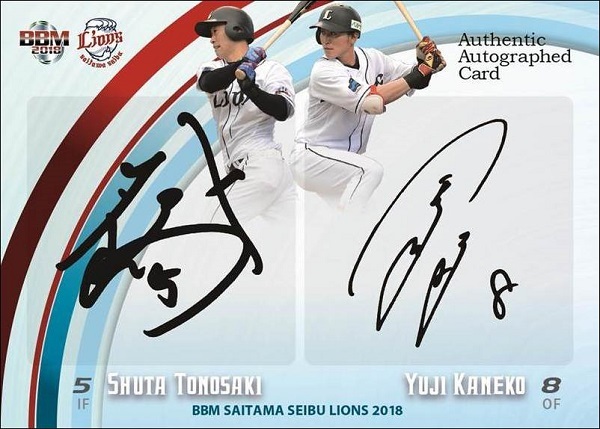 And three Lions appear in the cross-brand Picturesque autograph set. I'm not aware of any promo cards for the Lions set. Premium insert and autograph images are promotional images from BBM.